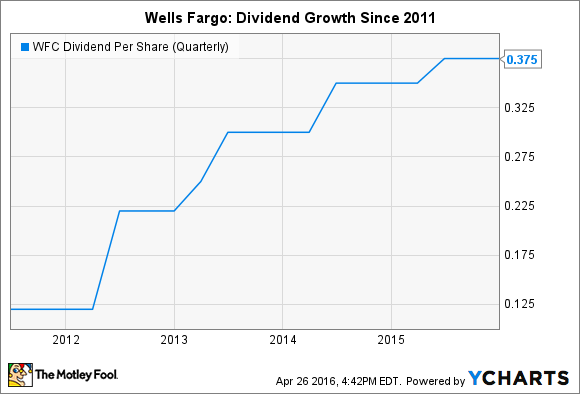 Is Wells Fargo the Best Bank Stock for Dividend Investors? When it comes to the consistency and predictability of its quarterly payout, it's hard to beat Wells Fargo. Banks have historically been popular dividend stocks, and Wells Fargo (NYSE:WFC) continues in that tradition. But is the nation's third-biggest bank by assets the best bank stock for dividend investors? There are two reasons to think that it is, and one to think that it isn't. The main reason income-seeking investors should like Wells Fargo's stock is because of its yield, which measures how much a stock pays out via dividends relative to its share price. As a general rule, a higher yield is better than a lower yield if the reason you're buying a stock is to generate income. That said, one that's far above comparable stock yields could mean that the underlying stock exposes investors to excessive risk, as yield and risk are positively correlated. Wells Fargo currently yields 2.96%. While this is the highest yield among big bank stocks, it's not so far above other yields that investors need to be concerned. To this end, JPMorgan Chase (NYSE:JPM) ranks second in the peer group with a yield of 2.75%, and the average stock on the S&P 500 yields 2.17%. From the perspective of yield, then, Wells Fargo seems to be the best big bank stock for dividend investors. The California-based bank also ranks at the top of its peer group with respect to the growth rate of its dividend. Wells Fargo has increased its quarterly payout every year since 2011, growing it by a total of 207%. WFC Dividend Per Share (Quarterly) data by YCharts. At first glance, this ranks Wells Fargo third among the nation's biggest banks with respect to the five-year growth rate. But the two stocks that outrank it -- namely, Bank of America and Citigroup -- have each increased their dividends only once since the financial crisis. Wells Fargo thus also comes out on top when it comes to a consistently increasing dividend. The one area where Wells Fargo arguably lags its peers insofar as dividend investors are concerned is its payout ratio. This measures the percent of earnings that a bank distributes to shareholders each year. Most banks prefer to allocate their earnings equally among dividends, share buybacks, and retained earnings. This would equate to a dividend payout ratio of 33%. Wells Fargo has a payout ratio of 38.6%, according to data from YCharts.com. This is nothing to be concerned about, but because it's the highest ratio among its peer group, it does suggest that Wells Fargo has less room to boost its quarterly payout in the future than, say, Bank of America, which pays out only 16.1% of its earnings via dividends. That being said, Wells Fargo's earnings are more substantial than most of its peers, and they grow at a much more consistent rate than any other big bank that comes to mind. As a result, whatever it lacks in terms of its already-high payout ratio, it makes up for with consistency and predictability. In sum, looking at the three main metrics that investors use to assess dividend stocks, it's clear that Wells Fargo is one of the best bank stocks for dividend investors.